This month’s EAAS meeting can be summed up in one word, ‘Excellent’. The meeting began with our chairman John McConnell describing the latest events that have been happening in the day and night sky that our club's active amateur astronomers have been following closely. First on the list was planet Mercury’s best apparition of the year in the evening sky visible after 18.15 in the bright evening twilight as a lovely naked eye glowing ball. A number of our members have been observing the planet closely each clear evening. John McConnell and EAAS member Paul Evans managed to image the planet, check our gallery for the latest images. Next on the agenda was the sunspot activity this week which as been interesting not because of the numbers of spots but by the lack of them. There where a few days where nothing except a handful of pores where visible near the solar limb so keep an eye on our nearest star. Some of our members are keen solar observers who scrutinize the suns photosphere every clear day to see how it is behaving and are fully aware of the pleasant surprises that accompany this observing activity so do keep watch! Our webmaster Mark Stronge gave us all an update on the planned Messier Marathon in the near future where members will have a chance to observe and describe all 100 (there are 109/110 in the complete list) or so that will be visible on that night. This will be an all night observing session that will take place possibly at the beginning of April, weather permitting. He encouraged everyone to attend. Members should be aware that you do not have to stay the whole night, but if you do plan to then make sure to bring the appropriate refreshments and star charts etc. Keep an eye on the EAAS forum for updates. If the lack of sunspots was a surprise then so was the unexpected aurora activity that appeared for two nights in a row this week. The aurora was the result of a high speed solar wind stream hitting our planet from a coronal hole in the sun. Auroras were generally expected at high latitudes like Alaska but at the time were not expected at lower altitudes, so sky watchers where excited to see two nice displays in as many nights in the form of dancing green beams that dominated the low northern sky throughout much of the night. These where confirmed by a few observers but generally went unseen by many who suffered from a bad northern horizon or light pollution. The sun-earth environment is a fascinating area of astronomy both for the observer and the researcher which brings us to the theme of our latest guest speaker.... MIRUNA POPESCU! Miruna Popescu is now a final year PhD student at the Armagh Observatory, as well as a researcher at the Astronomical Institute of the Romanian Academy, Bucharest, where she worked for three years before coming to Armagh. Having a background in nuclear physics, she then completed her Master’s thesis (“The Variability of Active Galactic Nuclei”) at the Turin Astronomical Observatory. A few years ago she also worked as a summer research assistant at the Kitt Peak National Solar Observatory in Tucson, Arizona. Although her interest in astrophysics started with extragalactic physics, she then decided to direct her attention towards the Sun. Presently, she analyses data from the SOHO spacecraft, with the aim of discovering more about what is happening in the solar atmosphere that makes a million tons of charged particles leave the Sun every second, escaping its huge gravity and then travel through the planetary system as the ghostly “solar wind”. She is studying the origin of the solar wind, because she believes that there is a direct link between what we see up in the sky and space environment changes we feel here on Earth. 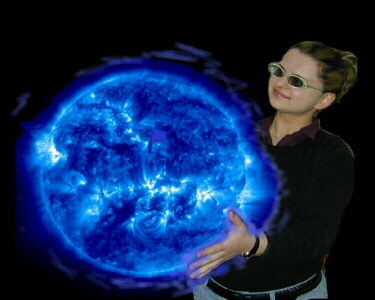 The title of Miruna’s lecture was: “Solar Mysteries Revealed”. "The Sun has been the subject of interest and worship through the whole of human history, but for thousands of years people did not know the answers to questions like what makes such a huge ball of fire burn, why does the Sun sometimes “disappear” behind the Moon, what are the “spots” that we see on its “face”, or what can sometimes create astonishing colour displays dancing graciously in the night sky." During the last century, much progress has been made in understanding the processes happening in the solar interior and atmosphere, and today we have data and means of processing it better than ever before. By studying different characteristics that the Sun shows, scientists are collecting pieces of the puzzle that grow into an increasingly clear picture of our star, and beginning to address some of the fundamental problems of present day solar physics: how the Sun’s magnetic field is generated, why its outer atmosphere is thousands of times hotter than its surface, how the solar wind is accelerated, and what makes solar flares occur. Check out our Solar Features page for an explanation of the many wonderful characteristics of our Sun. I can confidently speak for everyone by saying that this was the best presentation the EAAS has ever had! Miruna gripped our undivided attention from the very beginning of her to talk to the very end. Without using any back up notes, she delivered an outstanding talk on everything there is to know about our nearest star and its effects on our own planet which were backed up by a large collection of amazing images and movies from the SOHO and TRACE spacecraft. We watched animations of solar flares, coronal mass ejections, prominences and how sunspots are born and evolve within their complex magnetic fields and we watched sun-grazing comets burn up in the suns chromosphere. We learned about the physical and chemical make up of the sun and what causes the aurora borealis in our own night sky. Her talk was further enhanced by showing a selection of her own pastel drawings which showed just how creative and talented she was. I know that she worked hard on preparing her talk and if the 7th of March was a standard quality of her work then she will certainly shine as a supernova in the world of astronomy. The question and answer session which followed was a testament as to how much she had engaged her audience. These questions ranged from the interesting to the very technical and where enough to catch off guard a less worthy speaker but she handled these with ease like a true expert. While we were having refreshments members had a chance to have a more personal conversation with her which I did myself and found her life and interest in astronomy fascinating. On behalf of everyone present we would like to say thanks for your excellent presentation and talk which will long be remembered in the history of the EAAS!